If you’re looking for outfits for Disney World, I’ve gotcha! I’m definitely not a mom who buys character clothes for her kids *but* I’m making an exception for their Disney World wardrobe! I want the kids’ Disney clothes to be cute but not cheesy or too “character” – is that a total oxymoron? When I started searching for kids Disney clothes for our upcoming Disney trip, I was actually blown away by how many cute, affordable options there are for kids’ Disney gear – definitely not the cheesy stuff I rocked in the 90’s ;). I’m following the “3 c’s” of Disney World outfits: comfy, cute, and coordinating. Obviously, when you’re spending tons of time waiting in line, walking around and all-over just pushing the limits, comfortable gear is an absolute must. Nothing too heavy, nothing too hot, and ALWAYS comfortable shoes for Disney World! I also want my kids’ Disney outfits to be cute – it’s definitely the time to stretch the limits and have a little fun, but I don’t want to look back at the Disney pics in 20 years and think, WTF was my kid wearing?! So I’m trying to stick with classic colors and characters when packing for Disney. Finally, I’m going for coordinating. And I don’t mean matching Disney t-shirts for the whole family… my husband just would NOT go for it! But we’re definitely sticking with an overall theme each day, depending on the park. If you want to jump to the park or category, just click these links. You may be thinking… why spend the money to buy all Disney outfits for your kids if you aren’t a “Disney family”? Basically, I want every day we’re there to feel special for the kids and, since we aren’t a Disney-every-year kind of family, I’m ok splurging a little bit. Plus, everything I bought is cute enough for the kids to wear outside of WDW ;). So, I’m decking us all out – from clothes to underwear to pjs to swimsuits to shoes to accessories, my kids are going to be Disney head-to-toe! Keep reading to see what my kids are wearing to each park, outfit ideas for each Disney park, and a few outfit tips & tricks I’m excited to use! Lastly, like all things Disney, planning your kids’ outfits is time-consuming and a lot of work, but the research and prep – like, what will the weather be like when you’re visiting? – will save you money and time in the end! Below I’ve separated possible outfit ideas and themes by park and included actual pieces you can buy for your Disney trip! The Magic Kingdom costume policy states that kids under 14 can wear costumes to the park. BUT the forecast for Orlando in October still shows highs in the 90s… not ideal costume weather for young kids. Definitely check the weather before you shop/pack for your trip! We are visiting Magic Kingdom two days of our trip, so I have two totally separate outfit plans for each of those days. One day, we’re going with the Mickey/Minnie theme and the other day, the kids can wear costumes! if you have a Prince, let him act the part! Cooper *loves* to dress up, so I was so pumped to find him this little Prince Charming costume. I’ll be in a puddle on the floor. For a girl, Minnie Mouse EVERY.THING. 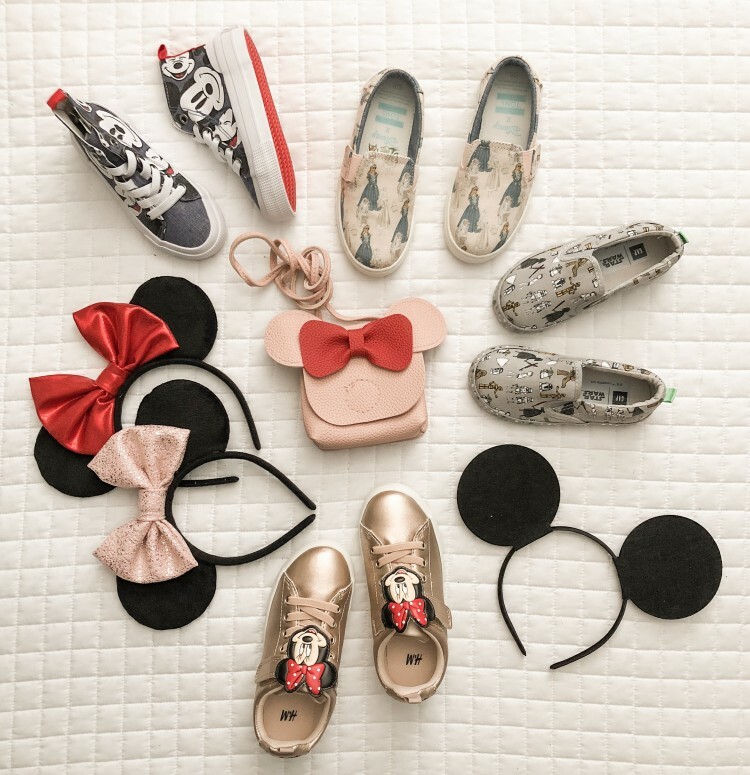 I bought Minnie sneakers and a Minnie dress simply because of the heat but depending on the time of year, you could get away with cute leggings, t-shirts, sweatshirts, jackets… there are so many darling Minnie pieces out now that it’s hard to choose! I also swooped up this little Minnie bag – SO CUTE! Did I mention it’s under $15?! These earrings are also a must for girls! Love these sunglasses too – $10! For a boy, old-school Mickey Mouse is the way to go. Sticking with a classic but cool color palette – think black and white or navy, red and white – will be fun and festive without being over-the-top. I got these sneakers for Coop. And this tee is ADORABLE! Any kind of Princess dress, skirt, t-shirt, shoes, sandals, leggings, shorts, sweatshirts, joggers – literally the sky is the limit. Princesses at Magic Kingdom include Anna & Elsa, Ariel, Aurora, Belle, Cinderella, Jasmine, Merida, Mulan, Pocahontas, Rapunzel, Snow White and Tiana. You could also go with a costume of the Princesses listed above. For shoes, I’m sticking to sneakers for my kids. There are TONS of adorable and comfy Disney-themed shoes out there now – be sure to check out Disney Vans, Toms x Disney Princesses, Mini Melissa’s Disney Collection – even Freshly Picked has some Disney baby Mocs. Don’t forget PJs to keep the fun rolling @ your resort! Love this Princess pair. A fun backpack for travel is also an option 🙂 – love this one for boys. The whole Hollywood Studios theme could go a lot of directions, depending on your kids’ ages and interests. Star Wars, Toy Story, Beauty and the Beast, any kind of Disney Junior show… lots of options! Gap – they have the cutest Star Wars gear + adorable Disney stuff as well. Zara – I wanted everything! Amazon – don’t forget to try Amazon, especially for Disney shoes! I’m definitely packing some cheap rain ponchos for the occasional Orlando shower. These are also super cute if you want to spend a little more. Also going to use this Disney packing hack from my friend Stephanie from Olive & Tate: pack each day’s outfits in a gallon zip-lock bag – that way if your kids are old enough to get themselves dressed, you can just toss them a bag and they won’t end up looking like disasters. Bring an extra change of clothes with you into the park each day – just pop a ziplock bag of clothes in your stroller and you’ll be prepped for a snow-cone meltdown or whatever Disney disaster may come your way. Whew! Did I miss anything, or are my kids’ outfits for Disney World ready to rock?